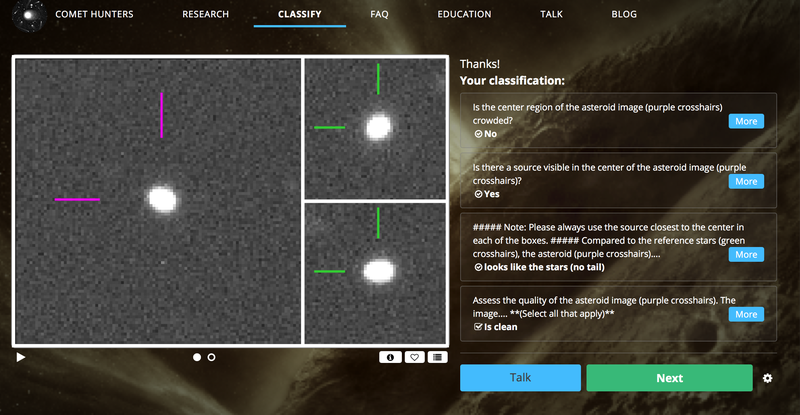 After classifying the asteroid image in the main interface, you’re presented with an option to discuss the image you’ve seen in Comet Hunters Talk, if you hit the ‘Talk’ button. Comet Hunters Talk is a place where you can discuss the images with other volunteers and with the science team. You can also label then image you’ve classified with descriptive hashtags like #tail. Thanks to our Talk moderators, we now have a list of preferred hashtags (see below) we’d like suggest you use on Talk to help flag images in ways above and beyond what we can learn from the classification interface and the questions we ask you there. We aim to also do a search using these preferred hashtags later on in the year to search for comet candidates and identify false positives. These are suggestions. Talk enables flexible labeling, so if you don’t find any hashtags from the list above that matches what you see, definitely create a new one!